On the surface, Ottawa, Canada's, Huntley Slim may appear very similar to many other bluegrass and old time bands. But their DIY ethic and energetic live shows revive a tradition not often heard in music today. With a straightforward approach to the creation and execution of their music, Huntley Slim focuses on writing what they know. Mining the collective minds of three distinct songwriters, the band's sound is as varied as their influences. With songs that cover a range of themes, including heartbreak, loss and the sweat of hard labor, Huntley Slim is able to reel in audiences of all ages. The band is comfortable in rowdy late night bars, as well as rural community centers and on outdoor festival stages. 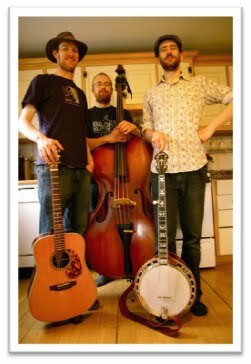 Huntley Slim is still Seamus Mulready on bluegrass and old time banjo, Chris Mellor on guitar, with the recent full time arrival of Devon Barrow on upright bass. On their third effort, the band has recorded a "what you hear is what you get" collection of six songs. 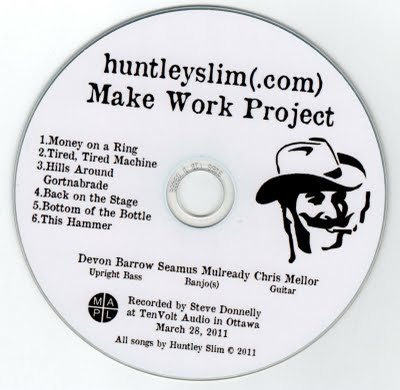 Recorded live off the floor at TenVolt Audio in Ottawa by Steve Donnelly (The Kingmakers, Ninety Pounds of Ugly), Make Work Project is a sonic mirror of what Huntley Slim sounds like live. With just three instruments and voices, the band has shown that they have the talent and passion to create music that is traditional and modern at the same time.